Note: I am not being compensated for any of these reviews. LOLOLOL, as if someone would pay me for something. I just wanted to share a few things I enjoyed. Amazon links are affiliate links, though. But like any passion, it ebbs and flows with the passing of time. The last four years have not been very conducive to nurturing my love for food production (or anything else, for that matter) as I’ve had to pour all my energy into parenting a disabled child. It’s been hard. Getting food onto the table for my family these days often feels like an insurmountable burden on my already-bowed back. I’ve found myself reaching more and more for convenience foods and takeout just to keep everyone alive. I recently decided I needed to nurture my lost enthusiasm for food production by revisiting some of the resources that got me excited about it in the first place. After all, seed-starting season is just around the corner, and last summer we built some raised beds in our sunny front yard with the hope that maybe this year we’ll be able to reap a harvest. (All past attempts to grow anything in our shady back yard have been deeply disappointing.) And along the way I happened to stumble upon a few new ones. If you could use a boost of energy when it comes to feeding your loved ones, consider checking out of one these resources. 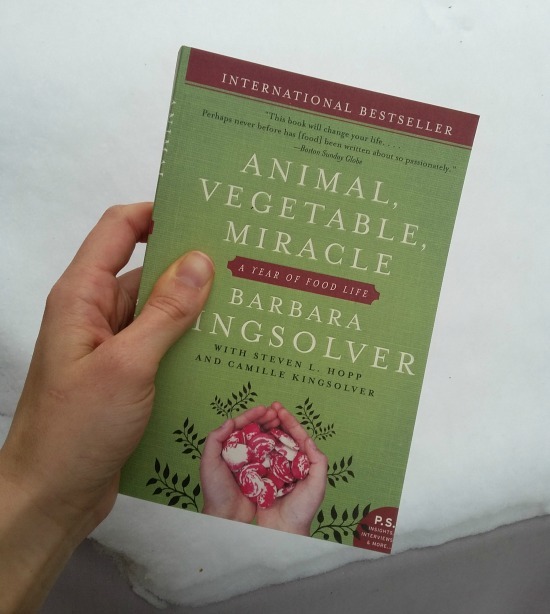 Animal, Vegetable, Miracle by Barbara Kingsolver. I first read this book when Lydia was a baby and it was a life-changer. Kingsolver, who is a brilliant novelist, writes about her family’s experience devoting one year to eating locally. For twelve months, they dedicate themselves to eating only what they can grow themselves or what they can buy from local farmers within their community. While she’s telling the story she teaches us the basic principles of gardening and poultry farming (They raise chickens and turkeys for eggs and meat). The book is filled with gorgeous descriptions of her garden produce that will make you want to run outside and till up the earth. It also contains reflections on the current (completely unsustainable) state of food production and consumption in the United States. It is both personal and informative, and will get you thinking about where your food comes from. Cooked with Michael Pollan (Netflix). This Netflix documentary series is based on the book of the same name (which I haven’t read, because that would require two hands that aren’t filled with a screaming child twenty hours a day). It’s divided into four parts, each focusing on one of the four elements — fire, water, air, and earth. As we learn about these four elements we also travel through human history: how we learned to roast meat over fire; how we learned to cook vegetation in pots; how we learned to infuse air into milled grains to create bread; and how we learned to ferment food (especially milk) with microbes before we even knew what they were. So it’s a lesson in anthropology as well as food science, history, geography, and more. Pollan also explores how the mechanization and commercialization of food production by corporations has influenced the ways we eat all around the globe today. And along the way, you might find yourself developing a deep desire to reconnect with your food. (My husband stayed up and watched the Air episode with me one night and now he wants to learn to master sourdough). And did I mention it’s gorgeously produced? The visuals are absolutely stunning. This quote from his book really stood out to me: “Is there any practice less selfish, any labor less alienating, any time less wasted, than preparing something delicious and nourishing for the people you love?” WOW. I love how affirming that is to the home cook. Salt Fat Acid Heat with Samin Nosrat (Netflix). This is another book-turned-Netflix-documentary, a format which is perfect for the parent of never-sleeping children. I watched all four episodes in the dead of night with a kid on my lap. It will make you want to get into the kitchen just for the joy and deliciousness of it. Like Cooked, it’s divided into four parts, which Nosrat claims are the four building-blocks of flavour. She’s less cerebral than Pollan, and dives into cookery head-first (she’s a chef by trade). She exudes energy and delight for food. The episode on fat takes her to Italy, where she looks at olive oil, pork fat, and Parmesan cheese. The episode on salt takes her to Japan where she explores sea salt and soy sauce. The episode on acid takes her to Mexico where citrus fruits are a staple in making delicious food. And the episode on heat has her in her home city of Berkeley where she cooks with her mom. The whole series is fun and exuberant, but the trip to Italy was my favourite. PS I love her casual approach to cooking, her willingness to try new and strange things, and the way she gets her hands right into everything she cooks. She’s a delightful guide. That’s it for now! Do you have any hands-free resources to recommend to continue fuelling my passion for food? 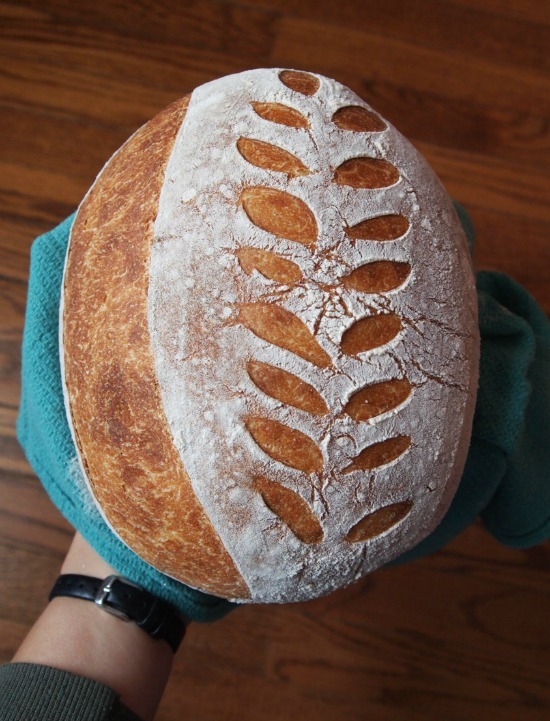 I’ve been having fun baking with sourdough for the last several months. I got inspired by Kate’s gorgeous loaves on her Instagram feed and just had to give it a try. When a local friend said she’d share her starter with me, I jumped at the chance! 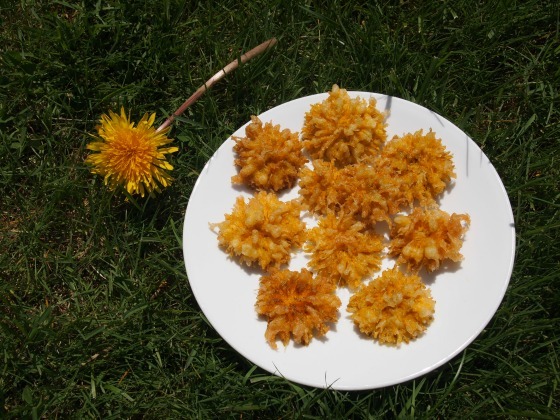 I’ve been sharing my own photos on Instagram, and a few people expressed interest in my recipe. So here you go! 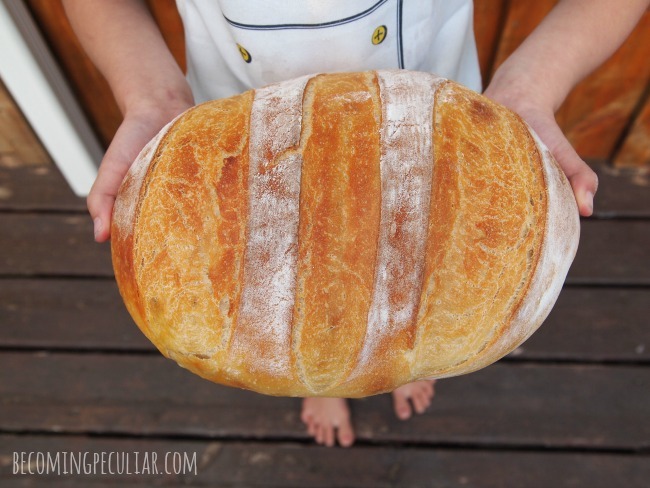 I could talk about sourdough bread and look at pictures all day. 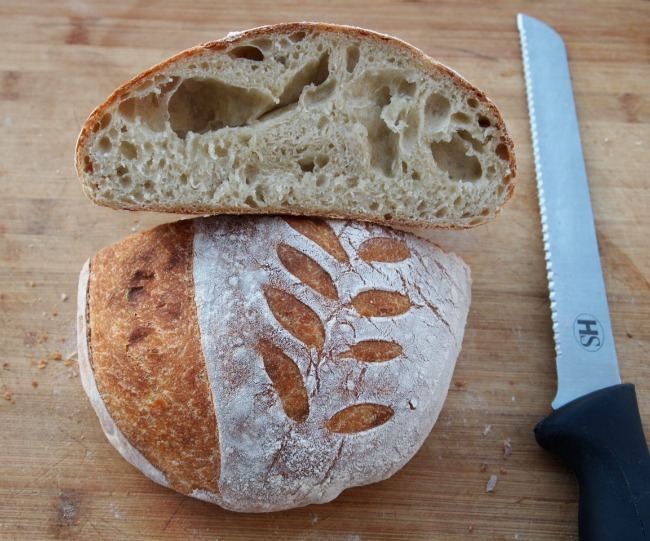 This recipe is for a basic white boule — a round, free-form artisan loaf. I love how beautiful it can look! I know whole wheat is more nutritious, but I took Kate’s advice and started with all-white flour, since it’s easier for the beginner. It is absolutely delicious, with a chewy, slightly tangy inside, an open crumb, and a crispy, flaky crust; and it’s healthier than anything you can buy at the grocery store. I always feel fancy when I serve it. The whole process takes about 7-10 hours; I usually do it in about eight. Of course, almost all of that is rising time; it only takes about 45 minutes total of hands-on labour. If you start really early in the morning, it can be out of the oven by late afternoon; but usually, I’m wrapping it up in the evening. The first two parts are super-simple, quick, and flexible — the time between can vary by a few hours as needed. You don’t even need to be home in between. Part three requires a little more attention and is slightly less flexible. 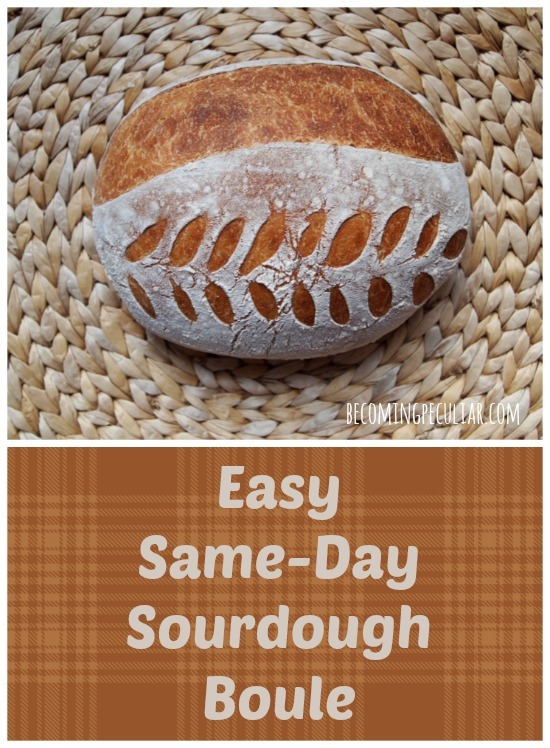 You can stick your dough or formed loaves in the fridge at any point in the process to delay it, even for a day or two, but my fridge is always so full there isn’t room for that, so I prefer the same-day method. 1. 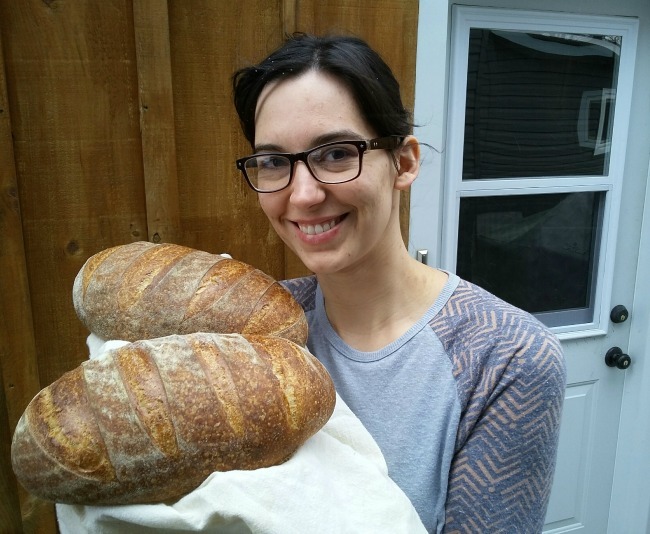 If you’re a beginner, I highly advise you to read through Kate’s Sourdough 101 post before you start. 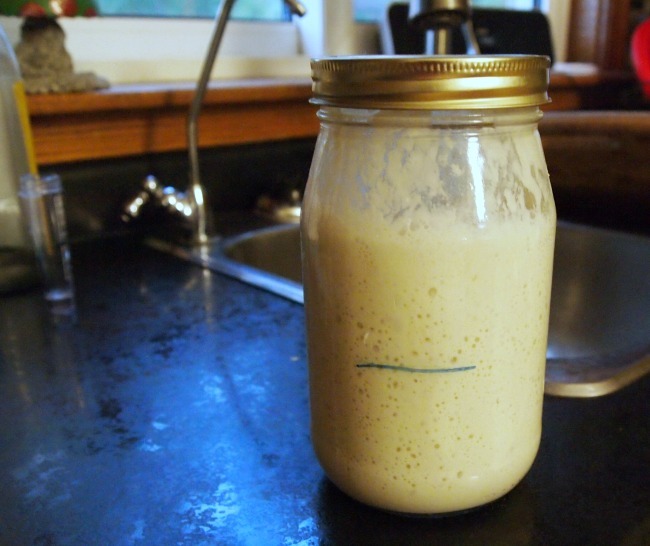 It’ll answer all your questions about how to acquire, care for, and use sourdough starter. When I got started I printed the whole thing out and underlined the most important parts. It helped me a ton. 2. You’re going to need to get your hands on a good, active starter. If you don’t currently have one, ask around your local friends. Put out a request on Facebook. 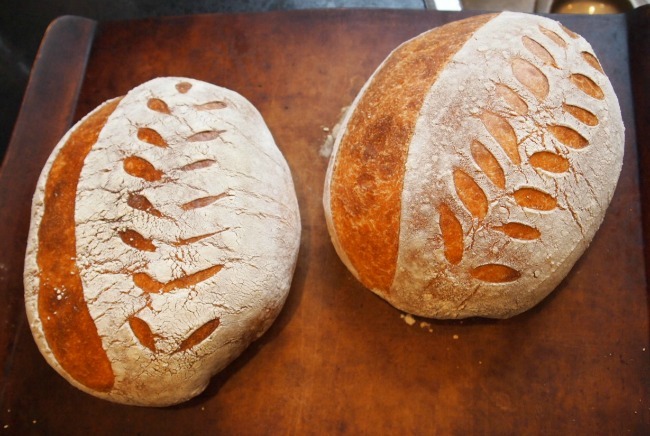 Sourdough bakers always have plenty to spare, due to its constantly-expanding nature, and we love to share it. That’s how I got mine. (And if you’re local to me, ask me!) If this doesn’t work out, you can buy it online. I’ve heard great things about Simple Life by Kels. 4. You’ll need to feed your starter the night before Baking Day. (I’ll explain how to do this). Everything else happens the next day. Choose a day when you’ll be home most of the day. 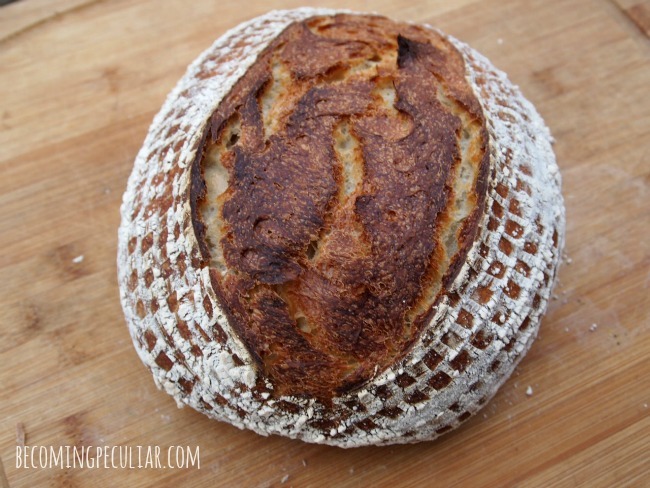 So: you’ve got your sourdough starter and you’re ready to go. Let’s do this! 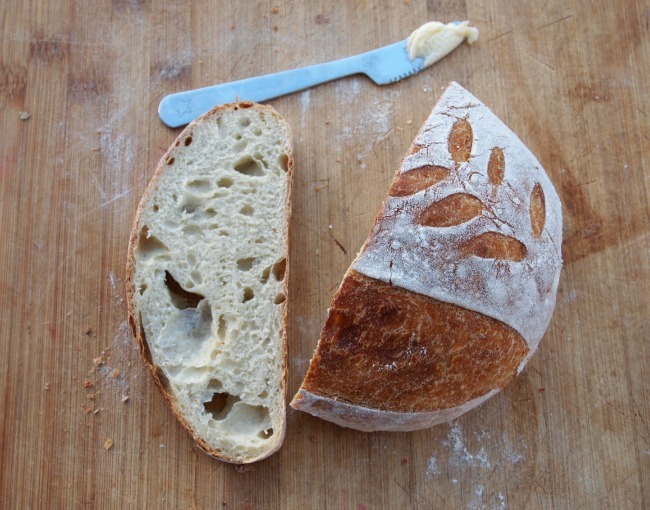 The night before baking day, take your sourdough starter out of the fridge and feed it. I feed it about 1 cup of flour and 3/4 cups filtered water. It should fill a quart jar about halfway, giving it room to expand overnight. Leave it on the counter to grow. Look at all those bubbles! That’s how you know it’s good and active. Stir down the starter to measure it more accurately. 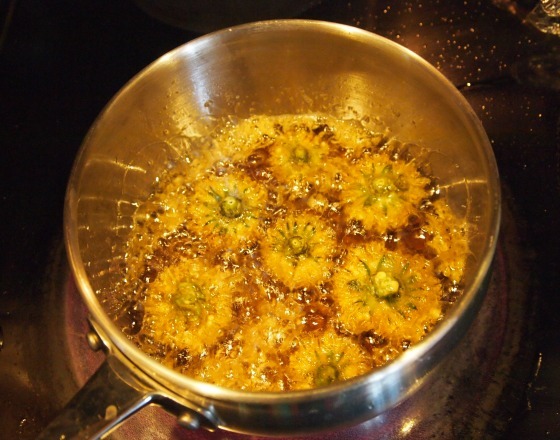 Mix the liquid ingredients in a small bowl or large measuring cup. Mix the flour and salt in a large bowl. Then pour the liquid into the dry mixture and mix well, first with a spoon, then with your hands. Don’t worry too much about kneading now. You’ll do a thorough job later. Just get it well-blended. Meanwhile, feed your starter in your jar (I do about 1/2 cup of flour, 5/8 cup of water) and put it back in the fridge. It’s done its job for the day. 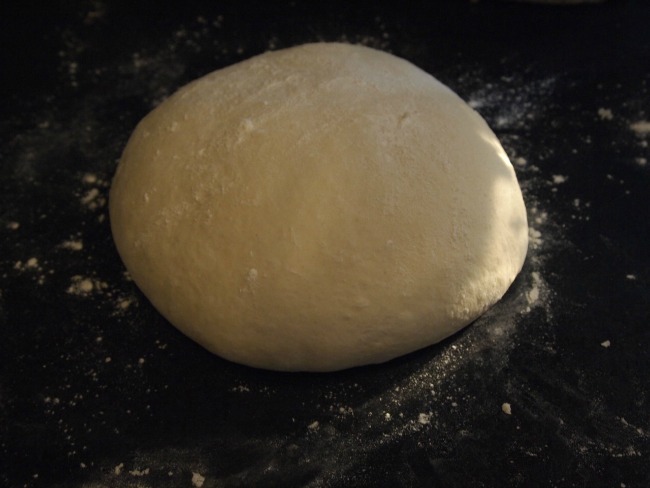 Here’s where you do a good, thorough knead to give the gluten its structure so it can rise nicely. Punch it down (it should have risen substantially by now), dump it out on a floured counter top, and knead with floury hands until it’s smooth and elastic. Put it back in the bowl, sprinkle with flour, cover, and put it back in the warmish oven for a second rise. Your dough should have about doubled. Punch it down gently and dump it onto a floured counter top again. 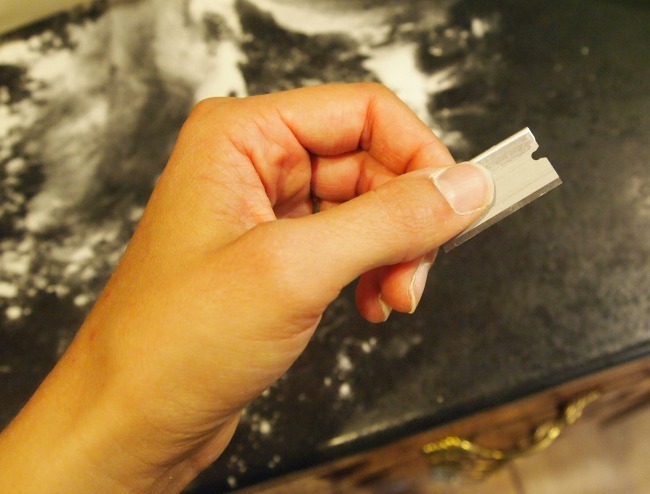 Using a serrated bread knife, divide the dough into two (if you’re doing a whole batch). 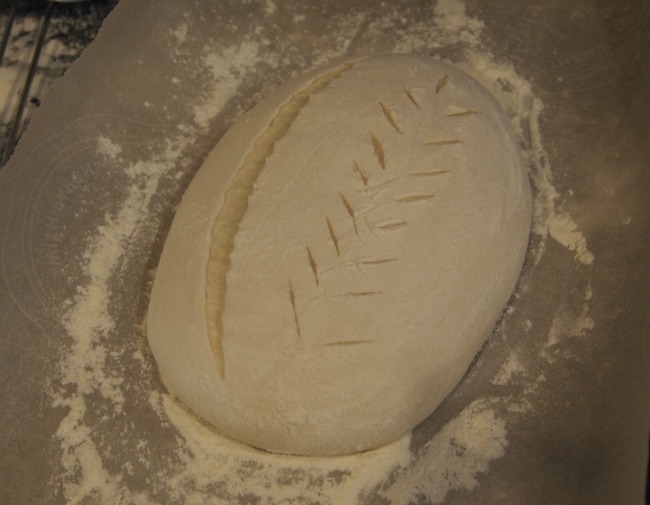 Using a kneading action, shape them into two ovals. Try not to overwork it, though, if you want that nice open (i.e. holey) crumb. 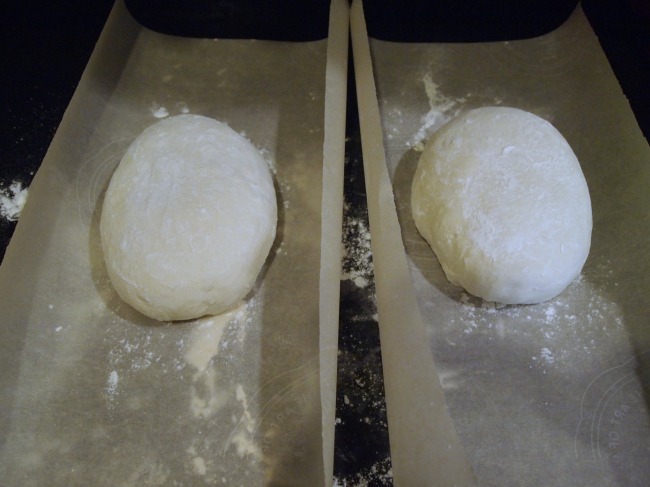 Cut two pieces of parchment paper, sprinkle with flour, and lay down your loaves on them, seam/ugly side down. Now sprinkle and rub the tops generously with flour (This is mostly for aesthetic purposes — it helps your scoring stand out better later). 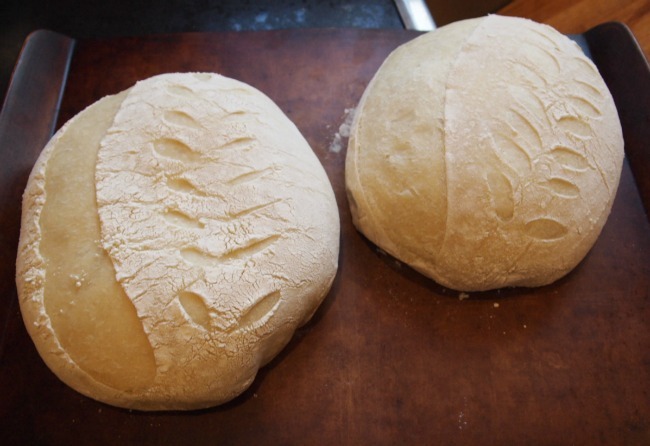 Cover your loaves with a towel and let them rise for about an hour. They don’t have to double because they’ll rise some more in the hot oven. 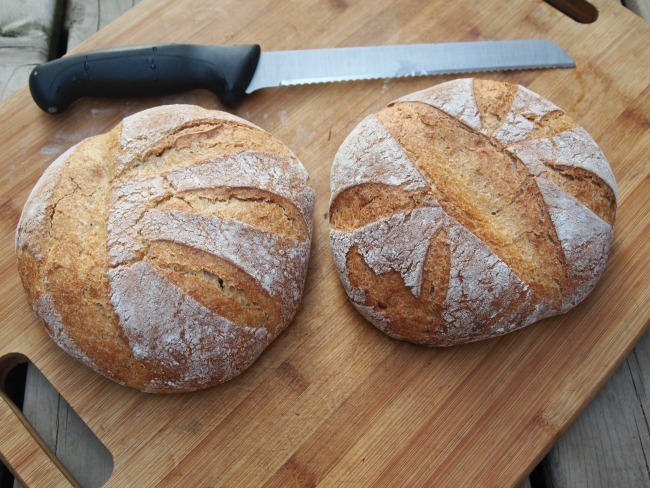 Note: you will bake the loaves in two steps: first, inside heated, closed pots; second, on a baking sheet or stone. After your loaves have been resting for about an hour, it’s time to heat the oven and pots. (The loaves will continue rising a little longer while everything heats up). 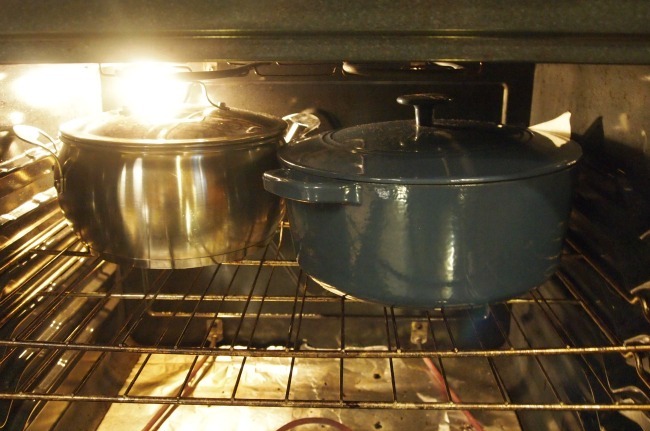 Place your pot(s)/dutch oven(s) with their lids into your oven, and set the temperature to 450F. It should take 10-20 minutes to reach that temp. Once everything is hot, you can score your loaves. This is the fun part! One of the easiest designs is just a couple of diagonal slashes across the top. It’s very attractive and classic. (I’ll share photos at the bottom.) I typically just use a serrated knife for that. OR, if you want to get fancy, you can use a razor blade. That’s what I used on the loaves in this post. Once your loaves are ready to go, carefully remove the pots from the oven and place on a heat-safe surface; remove the lids. 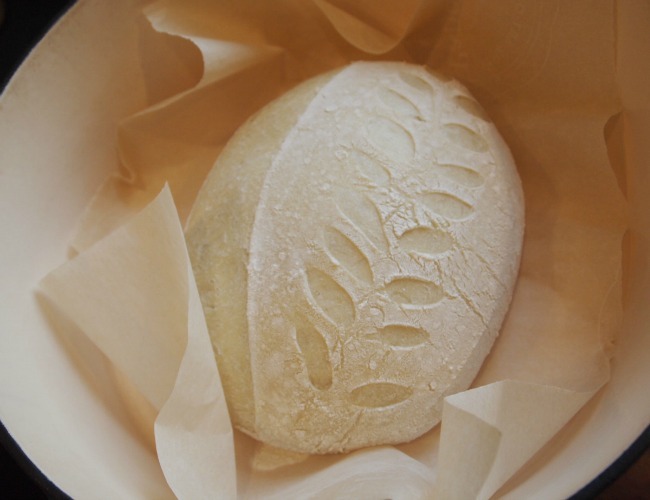 With each loaf: lift the parchment paper by its four corners and carefully lower the bread into the pot. (It will bake on the parchment paper for the first part.) Then put on the lids and put them in the oven. (Baking the loaf inside a closed pot at this point will seal in the steam and give you a wonderfully crisp crust). Bake like this for 15 minutes. The next phase of the baking process is done on a baking stone or baking sheet. After the 15 minutes are up, remove the pots from the oven. Wearing oven mitts, carefully lift out the loaves by the parchment paper. They should have sprung up in size, and the slashes will have opened up so you can see the finished design. Fun! I find that baking too long on parchment paper burns the bottom, so I want to get them off of there. It’s time for these loaves to get some air, anyway. Pop this back into the hot oven and bake for another 20-25 minutes, until nice and brown. Ta-da! Remove to a cooling rack to cool. Give them at least 30 minutes to settle down. You don’t want the inside to be all gummy from cutting into them too soon. I always freeze the second loaf as soon as it’s cool to preserve its freshness as much as possible. Often I cut it in half before bagging it so I can take out half at a time. Whatever is left on the counter after my family rabidly attacks it, I wrap in beeswax wrap for the next morning. It’s more breathable than plastic. Have fun with it! Even ugly loaves are delicious. Let me know how this works out for you! My own baking method is always evolving. 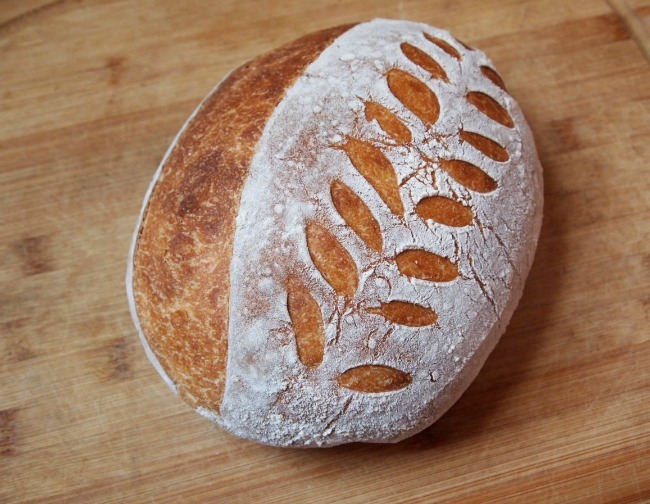 I’m excited to try out new scoring patterns, and want to start experimenting with whole wheat flour, other grains, and seeds. Poppy seeds would be pretty! Millet would add some delightful crunch! Oooh, can’t wait to bake my next batch! I spend way too much time in the kitchen. For reasons I don’t fully understand myself, I’m addicted to recipes that have way too many fancy ingredients and way too many steps. I can’t help myself. It’s a problem. I hate how much time I spend in my kitchen, but I just can’t stop. What many people might consider comfort food, I tend to find boring. No casseroles or pasta for me. I’m always hankering for something exotic, with lots of different textures and aromas and spices. It’s also very nourishing, made with simple, wholesome ingredients. It’s loaded with good fats, vitamins and minerals. It’s filling, too. 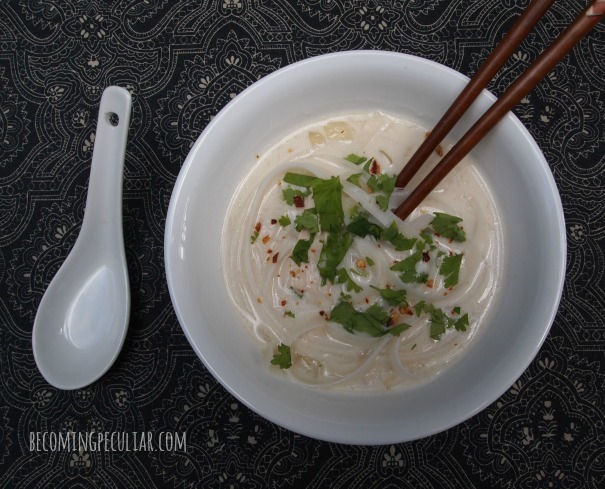 It features a rich, savoury broth turned magical with dreamy, creamy coconut milk. The fish sauce creates depth by adding sumptuous umami flavour. You can adjust the heat to your liking with red pepper flakes. It will taste like you simmered it on the stove for hours. You can serve it to your guests and they will all be impressed. Or just toss it t0gether for your family on a random weeknight. Go make this delicious soup! It will be ready in less than 30 minutes. Disclaimer: I am not even close to being Thai. I have not even been to Thailand. So I apologize to actual Thai cooks who are probably rolling their eyes at my attempt to imitate their rich cuisine. 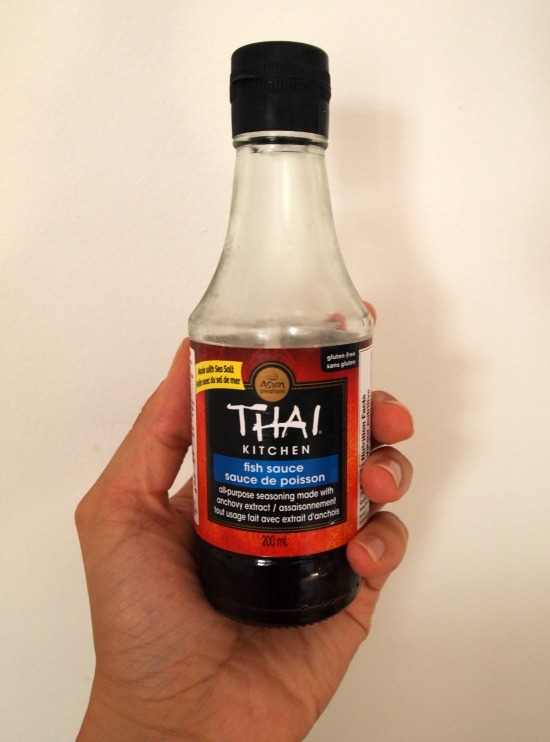 Thank you for your wonderful gift of fish sauce to the world. First, soften the noodles. You don’t want to actually cook them, because they will quickly turn to mush in the hot soup. 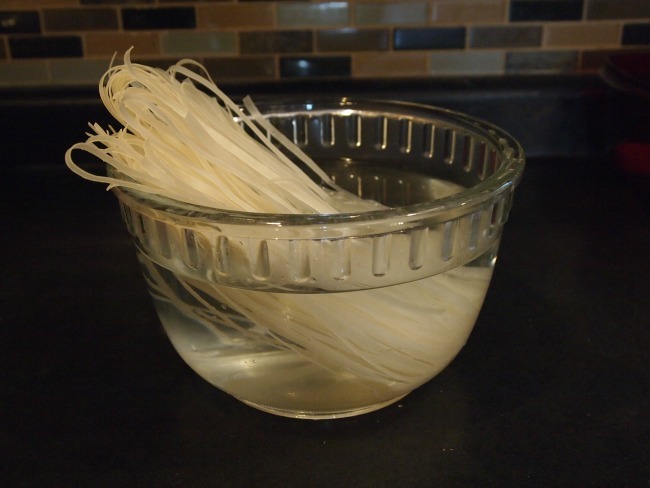 Just place them in a heat-safe bowl with hot water from the tap, to soak while you make the rest of the soup. Set aside. Meanwhile, melt coconut oil in a large pot over medium-high heat. Add chopped onions. Saute until softened, about 5 minutes. Add chicken stock, coconut milk, fish sauce, lime juice, and red pepper flakes. Bring to a simmer. Taste and adjust seasoning with salt and/or more red pepper. At this point, your noodles should be flexible and soft, but not cooked. A little firmer than al dente. Drain the water. The noodles will finish cooking in the hot broth in your individual bowls, kind of like how the beef in Vietnamese pho cooks in your bowl. To serve: Place a serving of noodles in each bowl, add desired amount of bean sprouts (if using), then ladle hot soup over it. Give the noodles a minute to finish cooking. Sprinkle generously with cilantro. Add another dash of red pepper flakes if you’re that kind of person. Listen to your kid complain, “I hate it! It’s horrible! I thought you were making pad Thai!” and then eat it anyway. Tada! Dinner on the table in less than half an hour. I’m sure you’re all heard of the health benefits of raw apple cider vinegar, some of which are anecdotal, some backed by science. Raw apple cider vinegar contains potassium, amino acids, and antioxidants, which are good for overall health. 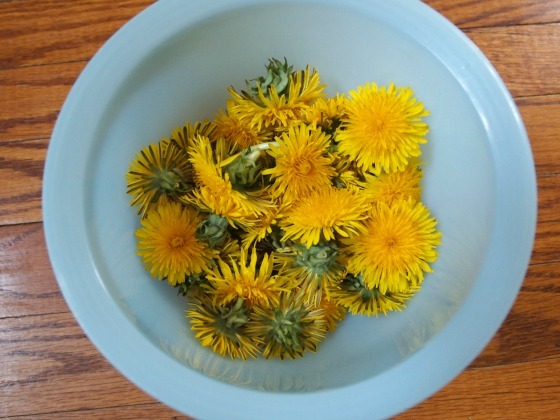 It contains acetic acid which can help kill pathogens, including bacteria, making it beneficial when you’re sick. Some studies suggest apple cider vinegar may help with weight loss; it may help with type 2 diabetes; and some say it might even help prevent cancer. (This article explores these claims in more detail). While there isn’t a lot of really hard evidence proving the benefits of apple cider vinegar (which is unsurprising, since there’s little money to be made in it), it certainly can’t hurt to incorporate it into your diet. The trouble is, it tastes awful. Anyone else agree? I can’t stand the stuff. I don’t even like adding it to my salad dressing. It’s just not tasty AT ALL. I’ve heard people say they just force themselves to swallow a tablespoonful every morning, maybe with some honey to make it more palatable. I admire their self-discipline. They probably also go for long runs or do Crossfit every morning, too. I just know that I would never keep that up long-term. So I’m delighted to say I have found a way to take apple cider that’s actually enjoyable. I love this recipe! I look forward to mixing up a glass to go with my dinner, or even sipping on a glass for a mid-afternoon energy boost. And it’s SO SO SIMPLE! Just two extra ingredients (three if you want to be fancy). 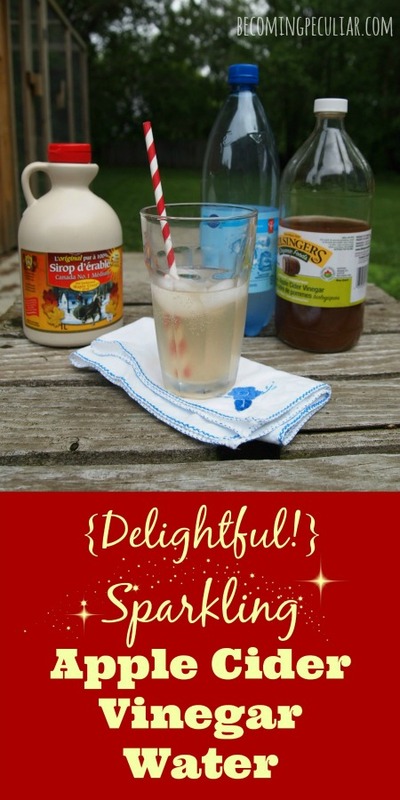 I first came across this recipe sweetened with stevia, but I’ve heard mixed reports on whether or not this sweetener is actually good for you. I don’t care for the aftertaste, either. So I substituted it with maple syrup, which was an immediate winner. If you’re currently addicted to soda, you probably won’t find this a perfect substitute. 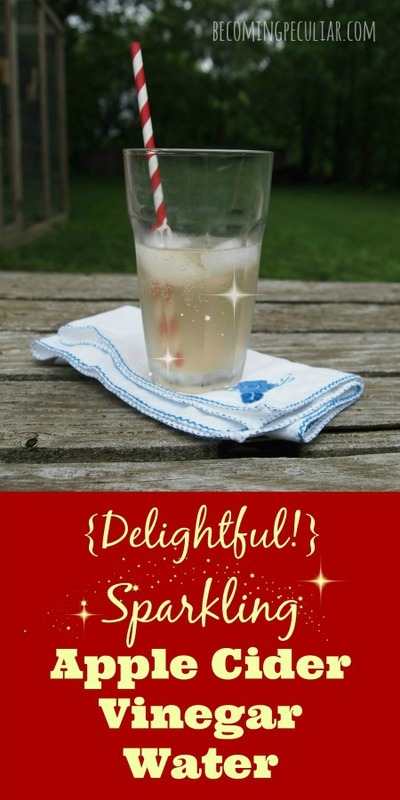 But if you already eat fairly healthily and have cut back on your sugar intake, I think you’ll enjoy this fizzy, lightly sweetened beverage. It feels fancy, even though it’s inexpensive and takes a couple of seconds to put together. And it feels good knowing it’s (probably) good for you. So please. No more choking down straight-up ACV for the health benefits. That’s just cruel. Take a moment to make it sparkle. Pour ACV and maple syrup into a glass; top with carbonated water (putting it in the glass in this order stirs it up for you a bit). Add ice and citrus juice as desired. Stir and enjoy! *I just use a no-name carbonated water from my local grocery store. No need to blow money on name-brand water. On the whole, our family probably spends less money on food than many North American families do, since I’m able to cook most things from scratch (mayonnaise, granola, yogurt, bread, etc), we grow some of our own food, and we almost never eat out. But I spend quite a bit more money on certain items than a lot of families (especially other lower-income families) do. And I do this voluntarily. Often, when deciding between two products, I’ll actually go with the more expensive one, which makes some folks gasp. Yup, I’ve heard them all. They can’t believe I’d willingly spend double to triple the amount on what seems, to them, to be essentially the same product. There are a number of reasons I do this, which I will outline below. Most Christians believe strongly in the importance of giving money to the poor. Most Evangelicals accept the idea that at least ten percent of one’s income should go towards Kingdom-building endeavors. This isn’t so different. The way I choose to buy my groceries is my attempt to help feed and clothe the poor, as Jesus commands, in a way that may be as effective as – possibly even more effective than – donating money in the traditional sense. I am choosing to spend a portion of my earnings on bettering the lives of other humans and non-human animals. Moreover, I try to keep in mind that we North Americans still only spend a tiny fraction of our incomes on food compared to people of other nations. While Americans, on average, spend only 6-10% of their incomes on food, Algerians, for example, spend almost 44% of their incomes on food (source). I don’t think it’s unreasonable, then, to be willing to spend a little extra to ensure that my food is ethically acquired. 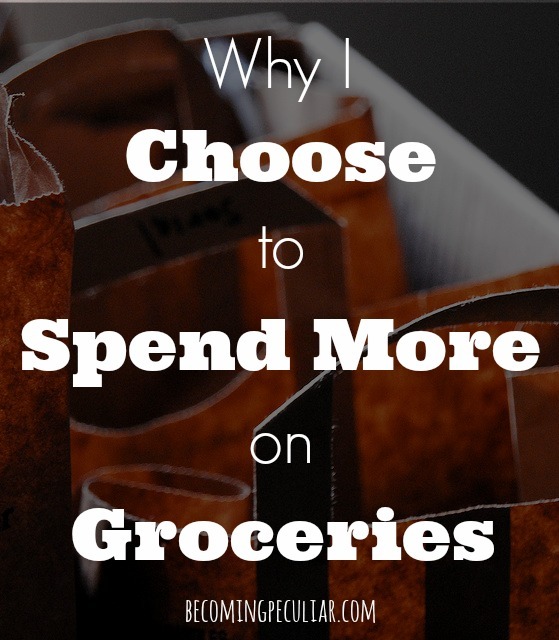 Here are some reasons why I choose to spend more money on groceries. 1. I don’t think I’m actually spending more in the long run. I believe it’s actually more economical to invest in high-quality (whole, local, organic) food, because it results in improved health for me and my family. That means less money we have to spend on drugs, dentistry, vitamin supplements, and the like. (As Canadians, we don’t personally pay for doctor and hospital visits, but we reduce the amount of taxpayer money that has to be spent on our health problems). As 11-year-old Birke Baehr puts it, “We can either pay the farmer or we can pay the hospital.” I choose to pay the farmer. We also save money because quality food fills you up better and longer. A hard-boiled free-range egg and a banana will go a lot further and give me a lot more energy than a coffee and donut, which will just leave me needing to refuel again soon (not to mention make me feel like crap and make me work less effectively). When my food is nutrient-dense, I require a lot less of it. 2. When it comes to animal products, I often pay more to ensure they’ve been raised humanely. When I can, I try to buy meat, eggs, and milk from animals that have lived their lives on the pasture, not in cramped, dirty cages or stalls. (When they’re not available, I try to avoid these foods altogether. We eat a lot of beans around here). I believe that God cares deeply for his animals and He grieves to see them treated cruelly. I don’t want to participate in the brutality characteristic of factory farms. It costs a lot more to raise animals on an open farm, so I have to be willing to pay more if I want to see animals treated well. 3. When it comes to things like sugar, cocoa, and tomatoes – foods that are frequently produced using slave labour, or bought at unfair prices – I choose to pay a premium for fair-trade certification, to ensure that farmers and harvesters have been paid a fair price. A lot of what we buy is so cheap in North America because people were exploited in the process of getting it here. As I mentioned above, we North Americans spend way less on food than people all over the world. The reason is because we’re practically stealing it from those people. If we wealthy suburbanites were all willing to pay a little more for our food, we could help ensure that farmers get paid what their crops are worth. 4. I buy organic not only for our own health, but also to ensure the land remains healthy for future generations, and so workers don’t have to be exposed to harmful chemicals. 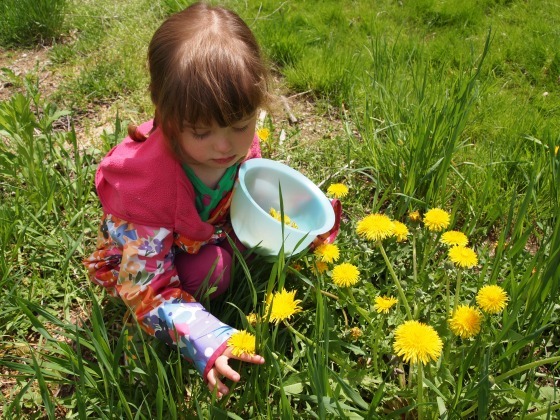 Pesticides are dangerous for everyone involved, not just us consumers. And they’re damaging our soil, water and air. Again, I’m willing to pay more money for food that is safely and sustainably grown and so no one has to suffer. 5. 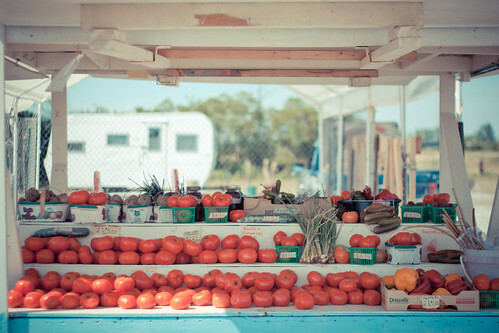 I sometimes pay more for local produce. Last June, in a weird twist of logic, I discovered in the grocery store that the strawberries grown here in Ontario cost more than the ones shipped in from California — that is, from the opposite coast of a different country! For the few weeks that strawberries were in season, I faithfully picked up a pint of Ontario strawberries and paid the extra dollar for the ones that didn’t take gallons of fossil fuels to get to me. This was just a small way I felt I could help reduce pollution. So these are just a few reasons that spending more money on groceries is part of my peculiar lifestyle. How about you? What factors influence the way you shop? Images courtesy of Anca Mosoiu and Sharon Drummond. I fell in love with pumpkin last year when I bought a couple of beautiful heirloom pumpkins for decoration. The elegant Rouge Vif d’Etampes and the whimsical grey Jarrehdale pumpkin looked amazing on my front porch throughout the fall. I took them inside when it started to freeze; and finally in December, when they’d enjoyed much admiration for their stunning appearance, I hacked them up, roasted them, and pureed them. Prior to then, I didn’t have much experience baking with pumpkin and the commercial pumpkin products I’d tried hadn’t impressed me all that much. Now I found myself with an abundance of puree on my hands and I started to experiment. Turned out I LOVED me some pumpkin. And those lovely decorative pumpkins ended up having sweeter, thicker, and smoother flesh than the traditional pie pumpkins I’d tried earlier. I used the puree mostly in muffins, breads, and risotto; but I loved it all so much I was eager to try it in different recipes as well. Pumpkin ice cream? Pumpkin cheesecake?! This year I planted the seeds of those two pumpkins and ended up with a whole pile of their handsome offspring. Now it’s pumpkin every day! One of my favourite creations so far is this pumpkin smoothie. I love it as a mid-afternoon snack. It was inspired by a recipe I saw on Pinterest from The Pioneer Woman, but that recipe called for canned pie filling and vanilla yogurt. Since I make my own pumpkin puree and yogurt, I knew I needed to deconstruct that recipe. Plus, I was pretty sure her recipe had more sugar and additives than I wanted. I was looking for a healthier, more frugal option. And so this smoothie was born. (If you are the kind of person who buys vanilla yogurt and canned pie filling, by all means, go ahead and try Pioneer Woman’s recipe). It’s delicious and nutritious! The pumpkin provides lots of nutrients, like beta-carotene (an antioxidant), vitamin C, and potassium. The yogurt provides beneficial probiotics. We’ve got healthy fats, protein, and fiber going on here, making it good and filling. I sweeten mine with maple syrup — no refined sugars over here! I personally find that the tang from the yogurt pairs perfectly with the pumpkin and the spice. The vanilla makes it extra-luxurious. And maple tastes great in every beverage, in my opinion. 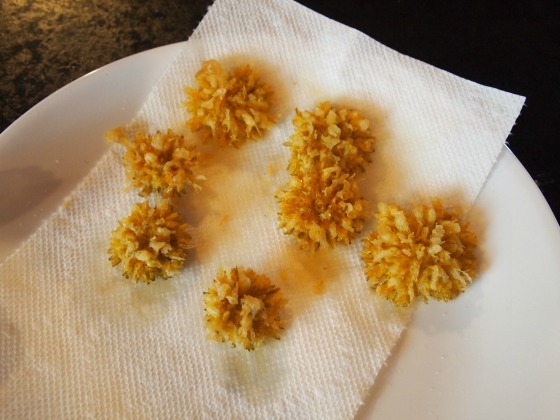 Before you try this recipe, you have to freeze your pumpkin puree in ice cube trays. (Like, the night before.) That helps make it creamy. And if you don’t have your own pumpkin spice blend, I have a recipe for that at the bottom. Blend everything together in a blender (I use my Magic Bullet). 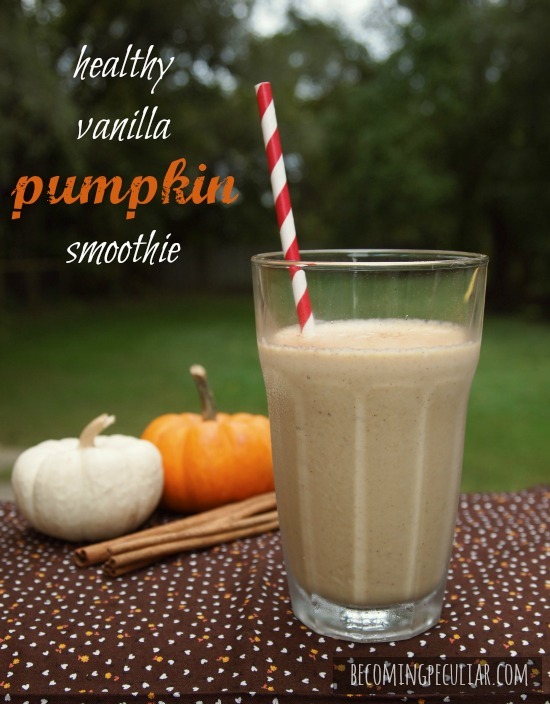 Make sure to do it good and long to make sure all the pumpkin gets blended in. Pour into a glass and sprinkle with cinnamon if desired. Enjoy! Blend together and store in a sealed container. It’s ready to join in on your pumpkin adventures! So . 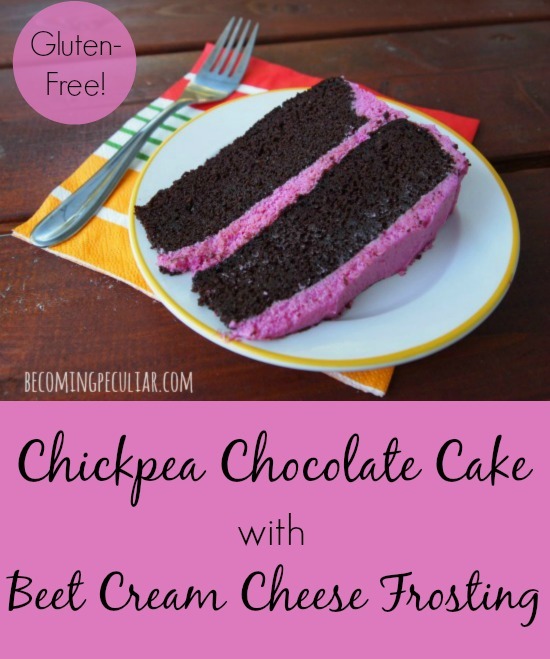 . . I’m pretty sure “chickpea” and “beet” are not two words you typically see in a birthday cake recipe. But what makes this recipe so interesting is that it looks and tastes like a totally normal chocolate birthday cake! I baked this cake for Lydia’s third birthday this last weekend, and no one could tell there was anything unusual going on. In fact, our guests raved about how moist and chocolatey it was, and asked for the recipe. It’s dense but springy and rich. 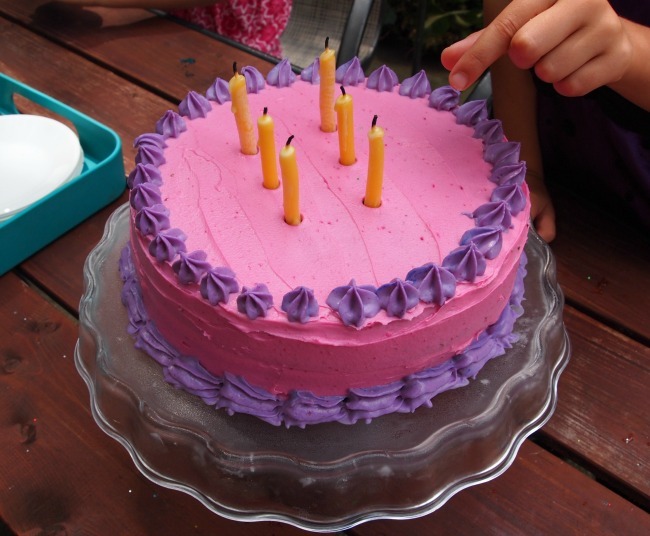 It’s a little less sweet than conventional or store-bought cakes, but that was intentional — I usually find birthday cake WAY too sweet, and I didn’t want to serve a really sugary dessert to our tiny guests. As I mentioned in my last post, I was looking for a cake recipe that was somewhat nutritious, not too sugary, and didn’t contain artificial food dyes, which can make children (and adults) cray-cray. This one fit the bill perfectly. Update 2017: I have now made this cake four years in a row, and it’s been a hit every time. I’ve learned how to frost a cake better, and have tried other colours. You’ll see photos from several cakes here, starting with my first attempt. The recipe originates from Nigella.com and is full of odd ingredients. I’ve made it many times over the years and have always been happy with it. I’ve doubled it here to make it a double-layer cake. This cake happens to be grain-free and gluten-free (if you use the right ingredients), even though we don’t generally eat gluten-free. I just think we typically eat too many grains in general, so it’s always advantageous to cut back when we can. Thanks to the chick peas and eggs, it’s quite high in protein. It works out really well for a double-layer cake because it has a flat top — they stack on top of one another beautifully. If you just want a single-layer cake for a casual gathering, halve the recipe, add a handful of chocolate chips, and serve with homemade maple-sweetened whipped cream. Decadence without damaging your body. I got this recipe from Joy the Baker, but I cut the sugar in half. It was still PLENTY sweet. And I boiled the beet rather than roasting it, since I only needed one. The beet flavour doesn’t come through at all — just the lovely magenta colour. Who needs FD&C Red No. 40, anyway? Butter two 9-inch round cake pans, and line the bottoms with cut circles of parchment paper to make sure your cakes come out nice and easy. Preheat oven to 350. Blend the chick peas and 4 of the eggs in a large blender or food processor until smooth. Then mix in all the rest of the ingredients until well blended. (They may not all fit in your blender at once. You may need to transfer to your mixer bowl and beat it with your mixer, after the beans are blended smooth.) Batter will be very runny, but don’t fret — it’ll fluff up like magic when you bake it. Bake at 350 for 30-40 minutes, or until top is firm and a toothpick comes out clean. Remove cakes from the oven and allow to cool for 10 minutes. Invert cakes onto a cooling rack to cool completely before frosting and assembling the cake. 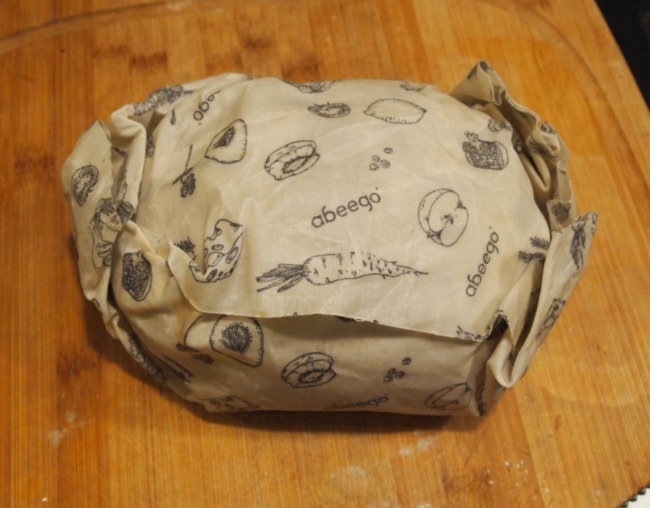 Carefully peel off the parchment paper. Meanwhile, wash your food processor, because you’ll need it for your icing. Wash and trim the beet, and boil in a small pot of water until you can easily pierce it with a fork, about 10 minutes. Remove from water and allow to cool. When it’s cool enough to handle, peel it and grate it with a microplaner or the finest grating plane on a box grater. Measure out 2-3 Tbsp for the icing; eat or discard the rest. Meanwhile, add butter, cream cheese and icing sugar to the bowl of your food processor, and blend until smooth. Stop and scrape down the bowl as necessary. Add vanilla, lemon juice, and salt, and blend it in. 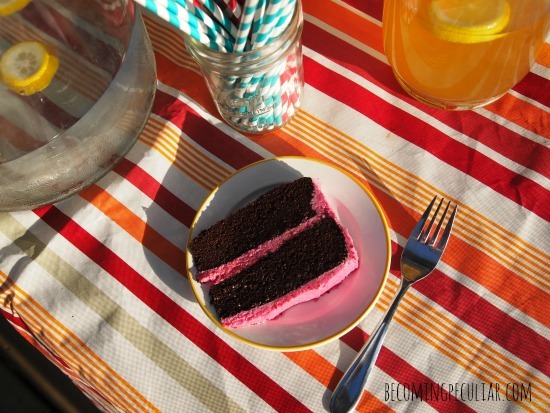 Next, you want to colour your icing by blending in your grated beet. I find the best way to do this is to first blend it into a small amount of your icing separately, then add it back. Remove a few tablespoons of your prepared icing into a small blender/food processor/coffee grinder (I use my Magic Bullet), along with the shredded beet and milk. 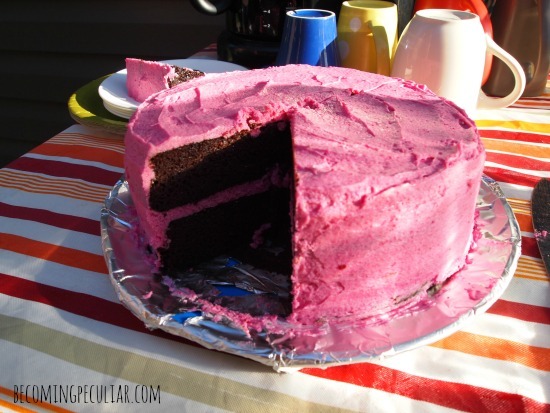 Blend until smooth, and you have a deep, rich magenta icing. Then add it back to the rest of your icing and blend until mixed. Refrigerate the frosting for 30 minutes before frosting the cooled cakes. 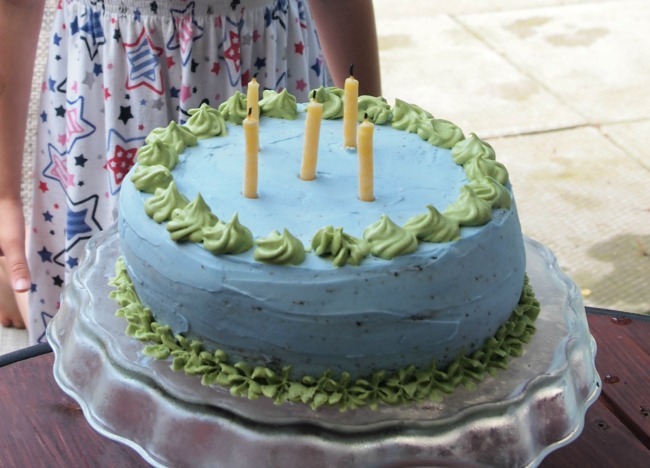 Updated to add: for a fancier cake with more decoration, make 1 1/2 batches of icing. You can then colour the extra icing a different colour, and use it to pipe on decorations of your choice. Place one layer of cake on a cake stand or plate. Top with a generous amount of pink frosting and spread evenly. Place the other cake on top of the frosting. Top with more frosting. Work frosting onto the sides of the cake until evenly covered. 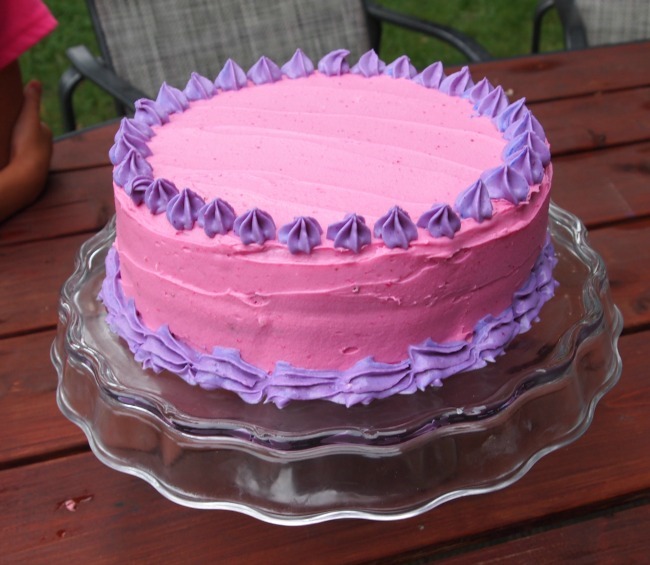 If you’ve made extra icing in another colour, pipe it on with a cake decorating kit. Refrigerate for at least an hour before serving, to make the cake easier to slice. 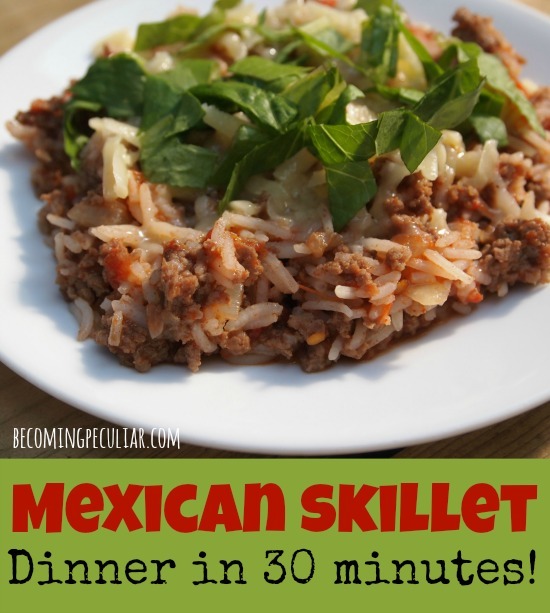 Mexican Skillet and Rice: Dinner on the Table in 30 Minutes or Less! I have gotten myself in the habit of always only cooking elaborate dinners every night. I typically spend 2-3 hours working on dinner every night, with cleanup and everything. That’s way too much time in the kitchen every day when I have so many other projects I’d like to be working on. I do find it fun and satisfying, and our food is pretty fantastic (if I do say so myself) as a result; but sometimes, I’d like to give myself a break. Without resorting to junk food. Part of the reason I spend so much time in the kitchen is my desire to make everything from scratch. That takes longer than opening up a can of this and mixing it with a box of that. USUALLY. But real food can be quick, too. I just have to remind myself of this fact every once in a while. Lately, I’m interested in building up a repertoire of super-quick and easy (but still wholesome) dinners for hectic days when I don’t have time for elaborate ones. I don’t have a lot of these types of recipes, to be honest. But this recipe for Mexican Skillet fits the bill perfectly and has been a staple my whole life. Honest. I’ve been making it since I was ten years old. Back then, we used minute rice and bouillon cubes for flavour. (In fact, the recipe originates from the back of an Uncle Ben’s Minute Rice box, circa 1992). We topped it with chopped iceberg lettuce and orange Kraft cheddar (Cheese should not be orange, you guys. It’s made out of milk. When did you last see orange milk.) 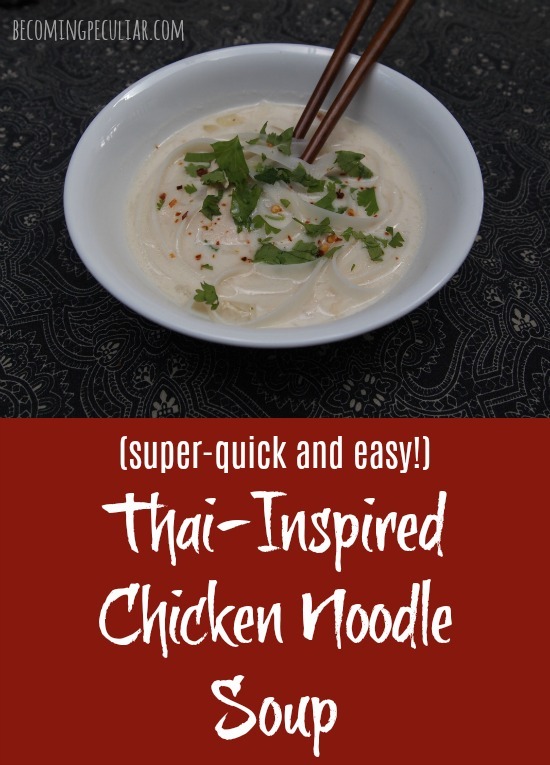 Over the years I’ve adapted it for a more real foods diet, but it’s still simple, quick, and delicious. 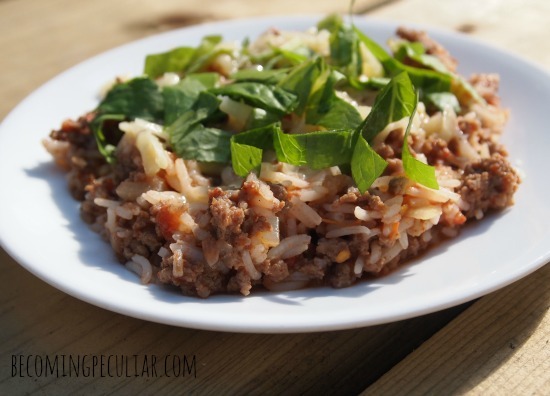 Better lettuce, better cheese, no powdered flavours, and real rice make this a winner. The next time you have to whip together a quick dinner in less than half an hour, try this one out. You don’t even have to have the beef defrosted ahead of time — just throw the meat right in your skillet, frozen, with a bit of water; put on the lid and let it simmer until it’s ready to brown. It’ll only add another 10 minutes to your total cooking time. I did this the other day and still had time to tidy the kitchen before calling the family in to eat. To start, get the rice cooking. I usually use basmati because it cooks up so quickly (20 minutes or less), but you can use your favourite long-grain rice (including brown) — just adjust water and cooking time as needed. For basmati, add rice and 1 1/2 cups water to a small pot over high heat. Cook until it starts to bubble; then reduce heat to low, cover, and simmer until tender. Meanwhile, brown ground beef with chopped onion in a large skillet over medium-high heat. Add tomatoes, salt and chili powder. Simmer until slightly thickened, about 5-10 minutes. Add cooked rice. Taste and adjust flavouring. You’re done! Serve with lettuce and cheddar. Growing up, I always thought I wasn’t much of a salad person. But that’s because my idea of what constituted a salad was very limited and sad. The only salad I’d ever encountered was that of the Kraft variety — gluey bottled dressing drizzled over iceberg lettuce, wedges of watery greenhouse tomatoes, and slices of cucumbers, sprinkled with solid blocks called croutons. As far as I knew, there were five types of salad in the world: Ranch, French, Italian, Caesar, and Thousand Islands. All of them were pretty meh. Even when I got older and started experimenting with other flavours from the bottled dressing aisle — creamy poppyseed, sweet onion, raspberry vinaigrette — I found myself terribly dissatisfied. Everything tasted flat and plastic-y. They would sit in my fridge door for literally years before I’d finally toss them. And honestly, if that’s all there was to salad, I wasn’t missing out on much nutritionally. Iceberg lettuce and imported or hydroponically-grown vegetables are almost useless to the body, and bottled dressing is mostly just preservatives. No thanks. In my later twenties, when I started getting serious about food, I finally discovered the glorious variety and spectacular flavours of real green salads. Garden-fresh romaine, spinach, mesclun, arugula, kale, and broccoli; tossed with zippy creamy dressings or sweet and zingy vinaigrettes. 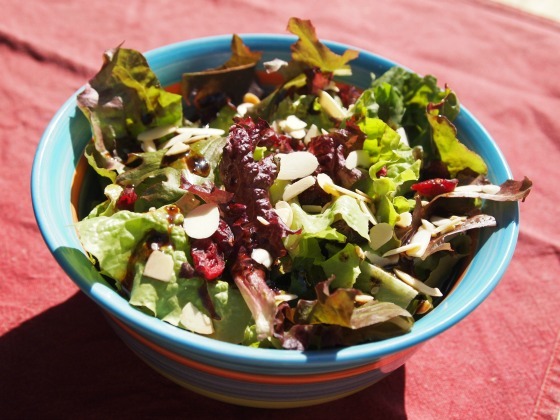 Salads topped with tangy fruit, crispy nuts, grilled meats, fresh herbs, and crumbled cheeses. They were packed with vitamins, protein, probiotics, and intrigue. They could even be a complete meal! But they were a lot of work. Composing a salad with hand-shredded leaves, homemade dressing, toasted nuts, and some kind of fruit took a lot of planning and hands-on time. It was too much effort for a side dish when I was already cooking the main dish from scratch. So salads were still pretty rare in our house, even though we loved them and they were so good for us. Until I discovered that having a few key ingredients on hand at all times made me salad-ready anytime the passion for something crisp and cool took over. 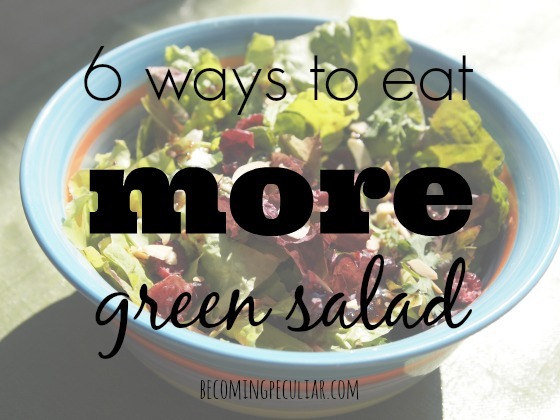 See, the problem is that the main ingredient in most salads — greens — are terribly perishable. They don’t last long once you pick them and or/take them home from the market. So the key to seizing the salady moment is making sure you always have all the other ingredients handy when you get your hands on some fresh, crispy greens. Experiment with different homemade salad recipes until you find some that you love. If you’re not a big salad eater already, keep trying new ones until you hit on a favourite. It took me a long time to find ours. Even try kinds that you think you don’t like due to early exposure to the Kraft version. I always thought I hated Greek salad until I tasted homemade Greek salad. Not even the same category!! They’re a ton of work at first but persevere until you find a few your family loves. There is hardly anything more nutritious and refreshing you can serve your family. And they will get easier once you are comfortable preparing all the other parts. Once you have these figured out, you can start prepping big batches of dressing and other toppings so you can throw together a quick salad at meal times without hassle. The toppings I list below are the elements of our favourite salads. Yours might be a little different. Make big(ger) batches of a few favourite dressings to keep on hand. Ours are Caesar, sweet balsamic vinaigrette, and more recently, Greek. Homemade dressings can be a pain to mix up last-minute, but if you make them ahead of time you’ll be so grateful when you’re scrambling for a last-minute side dish. I like to keep our fridge stocked with these throughout the spring and summer so that they’re always handy. I also find it essential to always have my fridge stocked with a batch of homemade mayo. With a bit of vinegar and other flavours or spices, homemade mayo can quickly be transformed into some of the most delicious creamy salad dressings you’ve ever tasted. 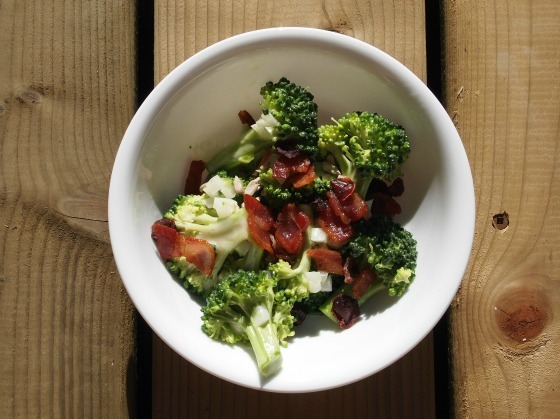 Most salads benefit from a crunchy element. Nuts usually fit the bill perfectly, especially with sweet dressings. And all nuts benefit from some toasting. It makes them crispier and enhances their flavour. But you don’t want to be toasting nuts while you’re also preparing the rest of your dinner. If you’re like me, you’ll burn them 75% of the time. My favourite nut is slices or slivered almonds; chopped pecans also make a terrific change. I do about a cup or two at a time, which will last for quite a few salads. They’re ready to sprinkle onto a salad at a moment’s notice. Keep your pantry stocked with nonperishable fruit. I adore fresh fruit (strawberries, blueberries, sliced apple, etc) on my salads. But I don’t always have fresh fruit on hand. (Canada, remember? We only have fresh fruit available five months out of the year). Dried and canned fruit are a wonderful, convenient substitute when fresh isn’t available. I find we eat salad much more often when I keep canned mandarin slices, canned pineapple, and dried cranberries on hand. 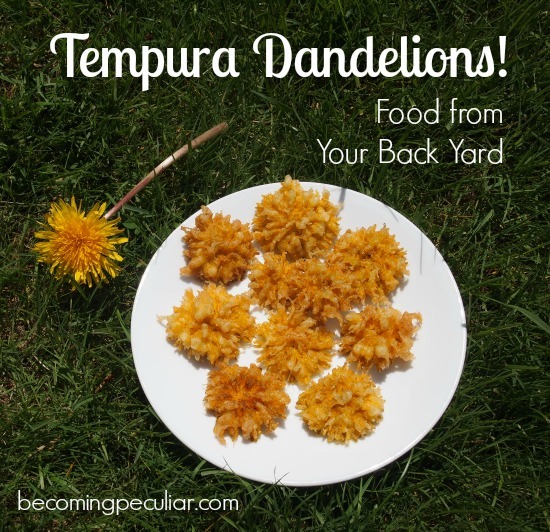 They are a delightful addition to leafy salads! Keep your fridge stocked with feta, fresh Parmesan and/or other cheeses. Feta cheese is another ingredient I try to keep on hand during salad season. It really zips up an otherwise boring salad, and takes little effort to crumble on top of your greens (or tomatoes or cucumbers.) If you don’t care for feta, you might prefer goat cheese or even Parmesan. Just a suggestion. What are your favourite salads? I could always use some more ideas!